Seventy-five years ago this month a group of military officers led a coup in Spain. But when the cities of Madrid and Barcelona held firm, the failed coup d’etat became a bloody civil war which would last from 1936 until 1939. The far-right governments of Germany and Italy supported the right wing rebels of General Franco, but the Spanish government had foreign support too. Thousands of volunteers went to Spain to fight as part of the International Brigades. This week, the National Archives released newly-discovered documents which revealed that many more people from Britain and Ireland volunteered than was previously thought. The volunteers defied the British government’s official policy of non-intervention in the war. In doing so, they came to the attention of the British Security Service, MI5. The National Archives’ documents show that MI5 was tracking the movements of around 4,000 people it believed were trying to travel to Spain to fight with the International Brigades. It was previously thought that there were around 2,500 British volunteers. This was believed to have included around 180 people from Wales – more than 30 of whom would die on Spanish battlefields. This week the Western Mail asked whether that figure might now be revised upwards. Among the volunteers listed in the 200 pages of MI5 files is “Robert Peters”, of Penarth, who was to return home on December 7, 1938. On their return the men were monitored by the security services and, at first, were banned from joining the British armed forces. That changed soon after as Hitler’s Blitzkrieg swept through Western Europe. Seventy years ago the people of Cardiff and Swansea were suffering hardship, injury and death as the Luftwaffe increased its raids against British cities. January 1941 saw a bomb cause severe damage to Llandaff Cathedral while, in February, Swansea became one of the first cities to suffer three consecutive nights of bombing. A special programme on the Welsh Blitz, which was shown on the 70th anniversary of the Swansea Three Night Blitz, is available on the ITV Wales website. The investigation into the death of weapons expert Dr David Kelly might be reopened, according to the Daily Mail. The newspaper says new Attorney General Dominic Grieve is considering a review of the suicide finding of the Lord Hutton inquiry. The Daily Mail says the Government might also reconsider the fact that there has still been no inquest, the usual procedure in sudden or violent deaths. Last September, for a programme called Wales This Week: The Welsh Connection, I interviewed a friend of Dr Kelly’s, author and security expert Gordon Thomas. He disagreed with Lord Hutton’s suicide conclusion and led calls for the inquest. The Daily Mail also claims that Justice Secretary Ken Clarke is considering a request from campaigning doctors to release medical files relating to the death. As reported here in February the previous UK Government had claimed that the post mortem examination report into the death of biological weapons expert Dr David Kelly was being kept secret to protect his family. Campaigning MP Norman Baker had asked then Justice Minister Michael Wills who had made the decision that medical reports and photographs connected to the death of Dr Kelly should not be closed for 70 years. He also asked on what legal basis the decision was made. Mr Wills told him: “No determination has been made that the medical reports and photographs connected to the death of Dr. David Kelly should be closed for 70 years. The UK Government yesterday claimed that the post mortem examination report into the death of biological weapons expert Dr David Kelly was being kept secret to protect his family. Campaigning MP Norman Baker asked Justice Minister Michael Wills who had made the decision that medical reports and photographs connected to the death of Dr Kelly should not be closed for 70 years. “Rather, Lord Hutton noted in his statement on 26 January that he had requested that the post mortem examination report relating to Dr. Kelly not be disclosed for 70 years in view of the distress that could be caused to Dr. Kelly’s wife and daughters. Rhondda-born Dr Kelly became caught up in media allegations that 10 Downing Street had interfered with an intelligence report ahead of the invasion of Iraq. On July 17, 2003, after two days of a grilling by MPs, Dr Kelly left his home in the Oxfordshire village of Southmoor and went for a walk. His body was found in woods nearby the following day. There was a knife at the scene and a cut to his left wrist. The official line taken by the 2004 Hutton report is that Dr Kelly took his own life. But there’s still been no inquest, the usual procedure in sudden or violent deaths. A group of doctors has raised objections about Lord Hutton’s conclusions. Last September, for a programme called Wales This Week: The Welsh Connection, I interviewed a friend of Dr Kelly’s, Welsh author and security expert Gordon Thomas. He also disagrees with Lord Hutton. He called for a full inquest into Dr Kelly’s death. A spokeswoman for the Foreign Office, which deals with MI5 and MI6, told me at the time it was “long-standing government policy not to comment on intelligence issues”. Three major events are being planned this month to commemorate those who fell in the battle against fascism in the last century. Searchlight Cymru’s Wales Hope not Hate day on Sunday, May 17, will also highlight what the organisation describes as the “continuing threat of fascism in Wales in 2009”. “This threat, although commonly perceived as being just against black and minority ethnic people, is actually a threat against us all,” said Searchlight Cymru. “Everyone is threatened by the British National Party and everyone can work together to remove that threat. In Flint, Swansea and Cardiff, from 10.30am, simultaneous events will feature readings at the Cenotaph of 100 names of those who fell in World War 2 against fascism, a laying of wreaths and two minute’s silence. Cardiff will also hold a similar event at the Spanish Civil War International Brigades Memorial at Cathays Park from 11.40am. A Welshman, who helped rescue more than 2,600 refugees from Spain during the civil war, was this week honoured by the people of Alicante. Archibald Dickson, captain of the merchant steam ship Stanbrook, risked his life to enter the port as the civil war drew to a close. On Sunday, his son and daughter, Arnold Dickson and Dorothy Richardson, joined an estimated crowd of 1,000 to hear tributes to their father. The crowd – which also included survivors from the evacuation – was told that Republicans from all over Spain had converged on the port on March 28, 1939 in an attempt to escape the country as Franco’s troops advanced to victory. Between 15,000 and 18,000 men, women and children gathered, desperate to flee Spain. But Archibald Dickson was one of only a few skippers prepared to take their vessel into the port. The Welsh captain filled his ship and ferried the refugees to Oran in North Africa. Manus O’Riordan, son of Irish brigader Michael O’Riordan, said 1,000 people gathered in the rain last Sunday on the pier from which the Stanbrook left “to pay particular tribute to the memory of Captain Dickson”. “For some of the survivors and their children this was a commemoration which, at times, was filled with unbearably raw emotion, culminating in a mass floral tribute to the sea, in remembrance of the dead,” he stated. 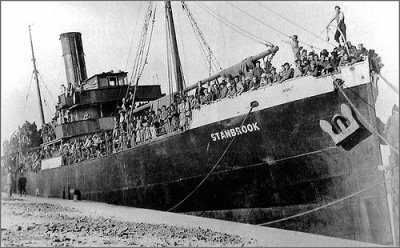 Archibald Dickson and his crew were all killed only eight months later when the 1,300-tonne Stanbrook was hit by a torpedo from a German U-Boat off Belgium. The ‘Wise and Foolish Dreamers’ project which works with relatives of International Brigaders has been looking into the possibility of a new memorial to complement the one already in place in Cathays Park. Some relatives have raised the possibility of a memorial in Cardiff either naming those IB-ers who died or all those who went to Spain. At the moment there is a general plaque in Cathays Park and a list of names on a memorial in South Wales Miners Library in Swansea. Quite separately, Leanne Wood AM has suggested a plaque be put somewhere in the vicinity of the Senedd. This is something the project thought was a pretty good idea, worthy of further discussion. As a group, we hope to not only remember people who gave their lives but also to encourage modern-day discussions about tolerance, war and peace. Leanne Wood was looking for AMs’ support for the memorial. …and then, as you may have seen in the Western Mail, Leighton Andrews got involved.